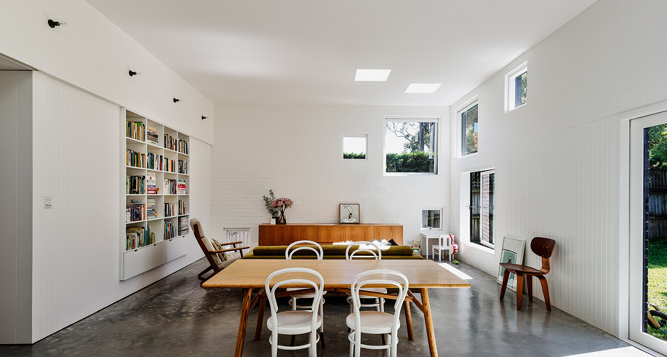 This project involved a renovation of a 1920s bungalow in North Randwick. The re-work required the removal of a 1970s renovation and a new brick addition has been added. The existing house has been rendered and modelled with some complex corbelling and fretwork. The formerly enclosed front porch has been opened up to reveal the original brickwork. In contrast to the decorative frontage, the sides of the house are completely utilitarian face brickwork. 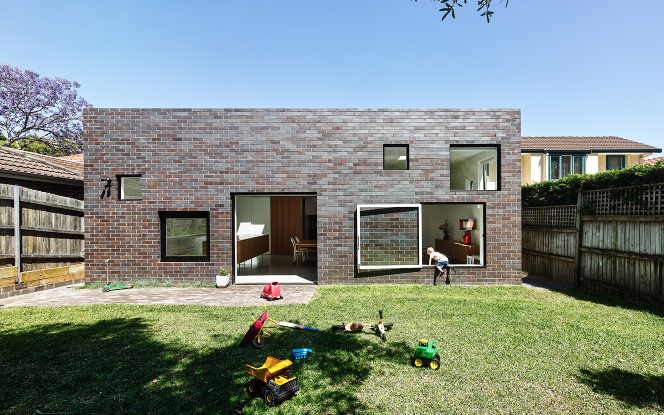 This face brickwork has been extended into a rear-yard addition housing the living spaces of the house and connecting with the garden. The site slopes up from the street quite steeply and steps rise to the front porch. The four main rooms of the original house have been restored, three are bedrooms and the smaller room connecting to the porch is used as a sitting room. A forth bedroom has been built in the new block. The bungalow’s central corridor runs through the middle of the site, steeping up to the new building as the land continues to rise. Every space in the original building has been cleverly utilised with antechamber spaces at the entrance to bedrooms now used for storage and one of the bigger concealed cupboards has become a study that can be closed off behind tall white panels. The interior of the bungalow appears to have retained a lot of its original features with timber elements inserted into original fabric. 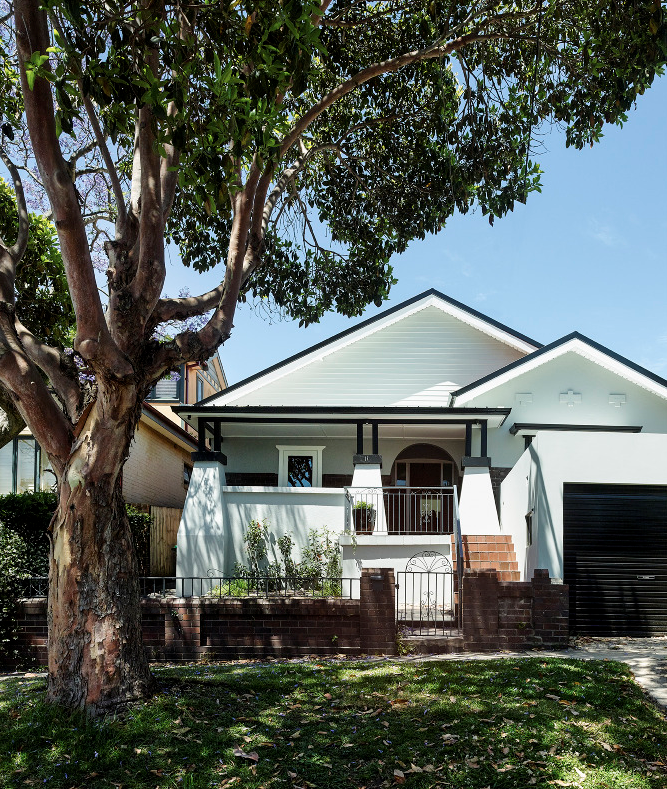 As is common with modern renovation of these bungalows the smaller spaces then opens up dramatically to a large, light, high-ceilinged open-plan living space with concrete floors. The new addition is a double brick construction, exposed external chocolate-brown brick outside and white-painted brickwork inside. Stuart Harrison in his book New Suburban talks of the new work’s “enduring simplicity” and “nod to the 70s”. 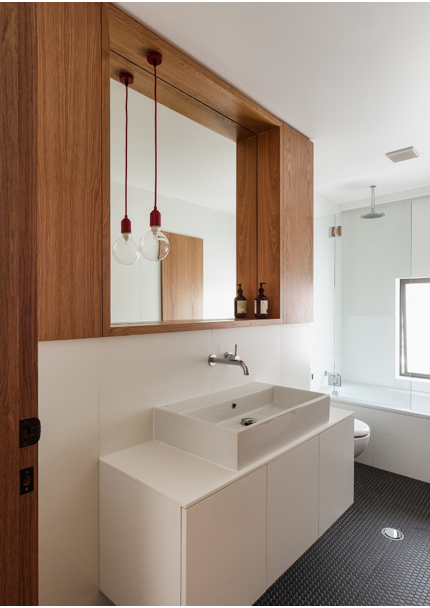 The largest opening has a concealed sliding door and the second largest is a casement window that doubles as a door, a quirk that children particularly enjoy. The overall design of this family home is elegant in its simplicity and yet playful; traditional as well as being a little bit edgy.